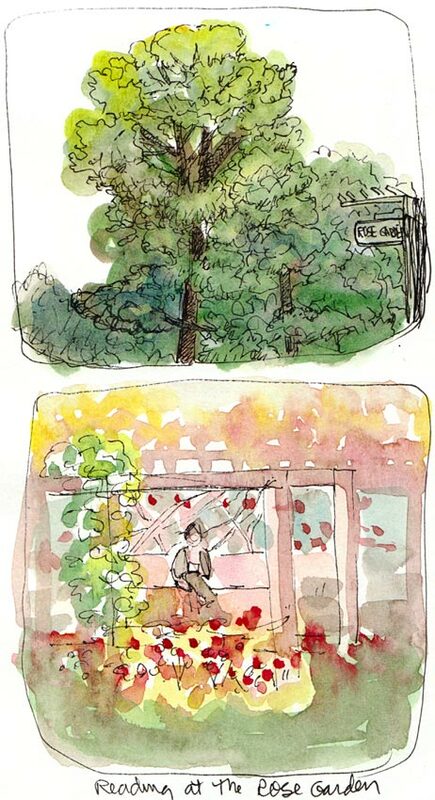 For our Monday night sketchcrawl we met at the Berkeley Rose Garden, sketched a bit, and then took a stroll along Euclid Ave. At sunset we sketched at the foot of the Rose Walk Path steps where two women residents of the cluster of Maybeck cottages there had a cheerful chat in front of a large Japanese maple while we sketched them. 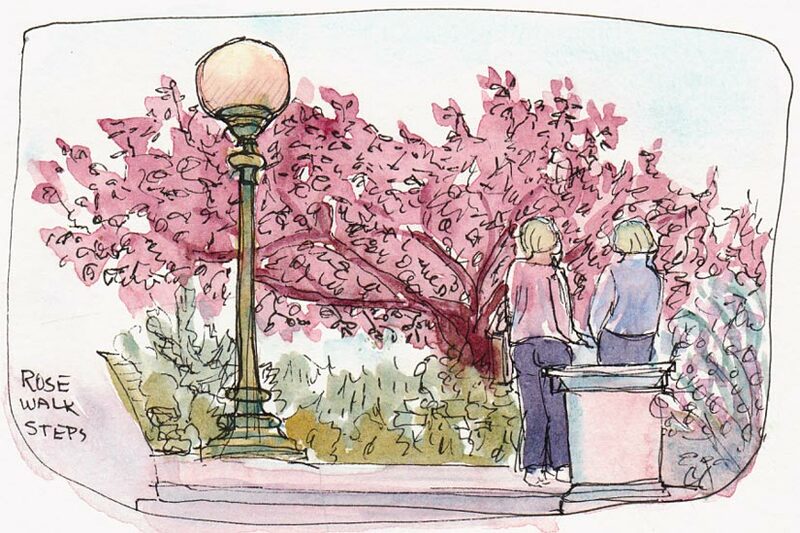 Inside the rose garden I sketched the trees and the person reading in a bright spot of sun. The hollyhocks on the right were our last sketching stop since it was totally dark by the time we finished them. The Squid Boat, ink & watercolor, 9x6"
On Sunday I spent the afternoon on a beautiful sailboat on the San Francisco Bay. After our sail my friend Barbara and I found a dockside bench near a cafe to sketch before heading home. 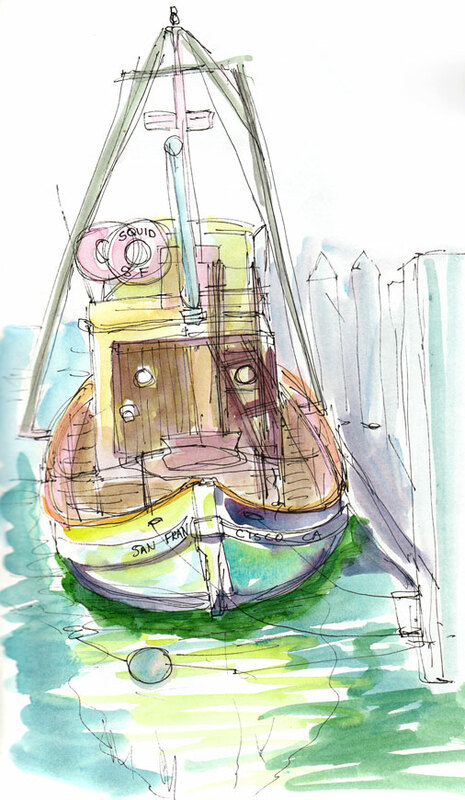 This funny little fishing boat was docked there and was a perfect subject for a quick sketch. A beautiful group of sketches – thanks for posting them! Thanks for the pics, Jana. I just wanted to say hello and let you know that I always enjoy your posts. I am in Concord so many of the places that you go to, including the Berkeley Rose Garden, are nearby and accessible. Hey Jana! I dreamt about you last night?! A bit random, I know. But I think it was a reminder that I hadn’t visited your blog in too long a time. Just spent a lovely half an hour looking around. Cheers, my dears. Ooh jana, these are lovely. I get so much pleasure from your work, from seeing the bay area through your discerning eyes. Beautiful sketches, you have a great perspective!